Here we see the vertebra from both sides: on the left side, we see it in left lateral aspect, and on the right, in right lateral. The images at the top are photographs, and those at the bottom are the interpretive drawing, so you should be able to find all the parts. Those of you who are long-time sauropod-vertebra lovers will immediately spot two things: first, this thing is weird. And second, the left and right sides are significantly different. We’ll show you the anterior and posterior views later this week: we have a lot to say about the vertebra, and we don’t want to dump it all on you at once. There is a lot to say about this bone, and I’ll talk in detail about the autapomorphies and asymmetry later today. (By the way, Autapomorphies and Asymmetry would have been a good a name for Jane Austen novel). I’d love to do it now, but as I write (5:07am) I have eight minutes before a taxi arrives to whisk me away to Gloucester station, whence a train will take me to London for a day of filming news stories about this awesome bone. I have to say in all honesty that I am surprised at the level of media interest: pleasantly surprised, but surprised. For example, there are articles in Nature News, The Guardian (where it’s on the front page of the online edition), The Times, The Mail, The Sun (though happily thire photograph shows me fully clothed), The Scotsman, Metro (a free daily paper that people pick up on the tube in London) and no doubt many others that I’ve not yet seen. 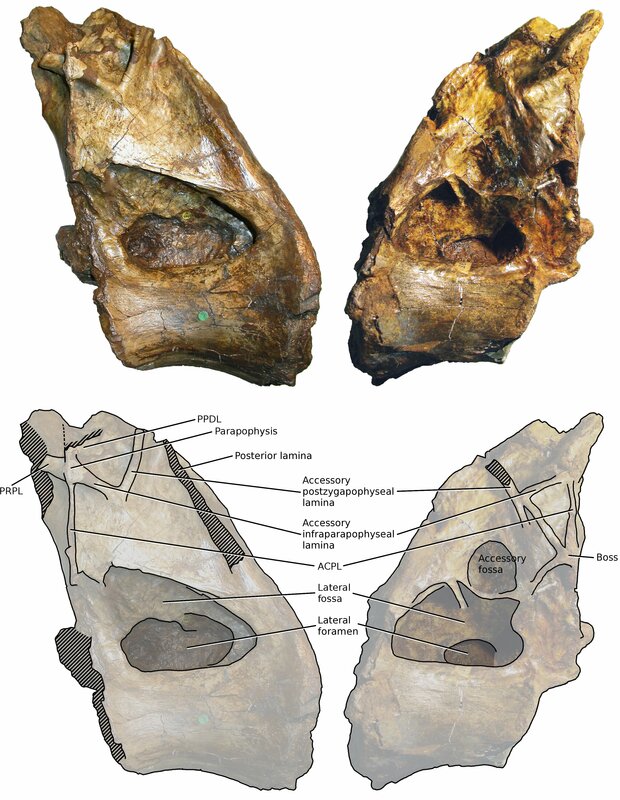 For those of you who can’t wait, the paper describing this specimen formally can be downloaded. But stay tuned: we can say things here on the blog that we couldn’t say in the paper. To anyone that cares.. I am currently unable to publish on my Tet Zoo scienceblogs site (due, I think, to some maintenance going on there), so have resorted to publishing a Xenoposeidon article on my ver 1 site here. I have hard copies of the Sun, Times and Grauniad articles for your viewing pleasure, Mike. I’ll bung them in an envelope to you. Interestingly enough, the only paper you were Page 3 for was the Guardian – a full-page spread no less! But because I’m an idiot I discarded the Metro before getting off the tube. They were kind enough not to call you a “boffin” or a “dino-detective”, although they did forget the extra “a” in “palaeontologist”. John Humphrys was tickled by your “pure love” quote at 6:45am, but it didn’t make the 8:00am “and finally” section of the Radio 2 news (I got my mum to check) which is where they like to stick dinosaur stories, mainly so that Terry Wogan can come on and wail “How do they know???”. Off to download the article now! Congrats! This is very very cool! I have a feeling that sauropod phylogeny just got a bit more complicated! But exciting! Actually, Amanda, sauropod phylogeny is not directly affected: because this thing is so weird, we couldn’t figure out where the heck it belongs. The best we can say is that the “standard tree” (i.e. a consensus between the trees of Upchurch and Wilson) still looks good and that Xeno must fit on it somewhere, but we have no idea where. The size estimation for extinct animals is often really a mess. Especially since it was discovered that sauropods hadly such big pneumatic systems. I suppose this makes a significant difference. Furthermore, do we have any idea how much fat sauropods had? Hi Sordes. Matt talked about pneumaticity in the Xeno week day 3 post, and I went into some detail in the day 4 post. Briefly, Matt’s 2005 paper estimates the mass savings from pneumaticity in some detail. As far as I know, no-one’s directly addressed the issue of fat quantitatively, although Greg Paul (1988) did note that his mass estimates were for lean animals at the end of the dry season, and that fat-bearing animals would have been heavier. I guess someone ought to check the literature on fat mass in big extant critters.